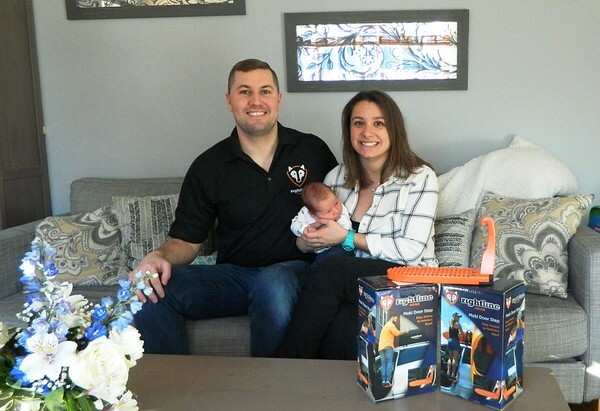 NEWINGTON – Resident-innovators Zach and Alyssa Brown, recently famed through ABC’s “Shark Tank,” are a typical young family making their way in this world. 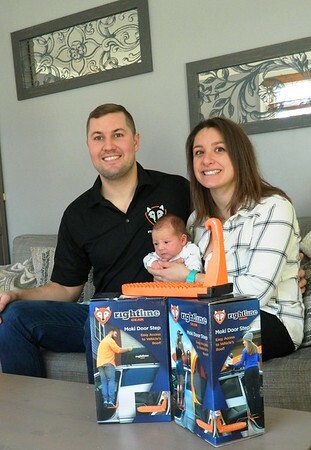 The Newington couple welcomed their second child, a son named Cole, two days before their appearance on national television with invention Moki Door Step. Viewers watched them accept a $3 million buyout for the product, which actually took place over the summer. Now Alyssa, 30, and Zach, 31, just want to settle into a quiet family life. “We want to raise our kids, spend a little slow, quality family time,” Alyssa said, holding her 10-day-old son while their daughter Peyton, 2, napped in another room. “The past two years have been busy, busy, busy,” added Zach, who works full time as a firefighter and paramedic. Alyssa is a registered nurse currently pursuing her doctorate. The couple owns a home in Newington. Since accepting the offer from ‘Shark’ Daymond John, the Browns have remained involved in product development with North Carolina-based manufacturer Rightline Gear. The Moki Door Step provides access to the top of a vehicle for “the vertically-challenged” as Alyssa described herself on the show, standing at five-feet tall. By hooking into the striker on the inside of a car door, it can support up to 400 pounds. This allows virtually anyone to reach gear on the rooftop rack, like the kayak the Browns offered as an example. The husband and wife team appeared on the show wearing T-shirts with their slogan, “Step up to your next adventure.” The product was named after ‘moki steps’, cliff-side footholds carved by Pueblo Indians in the American Southwest. The couple initially asked the ‘Sharks’ for $150,000 in exchange for a 5 percent stake in their invention. John offered $450,000 for 20 percent, which the couple refused, before accepting the $3 million offer, equal to a valuation. Rightline Gear’s Moki Door Step is currently available on mokidoorstep.com for $44.95. It measures 8.75 x 3 inches in length and 5.25 inches in height and features an earthy orange hue. Now the Browns’ biggest challenge is battling product knock-offs saturating the market on websites like Amazon.com. Not only are the counterfeit ‘Mokis’ highly illegal, the Browns say they are also far inferior to the authentic product, which is made from aircraft-grade aluminum and weighs in at just under two pounds. “Obviously we care about the company, but the main thing is, we don’t want to see somebody get hurt,” Zach said. Patents take up to five years to be finalized. Dealing with legal ramifications can be fatal to a new product. In the future Zach would like to tackle product infringement as a commercial barrier to small business owners. As the original designer and builder of his product, he encourages other young innovators to do it themselves. The couple invested their entire savings to launch their product. At the end of the month shoppers can expect to find the Rightline Moki Door Step at retailers of outdoor gear. Posted in Newington Town Crier, Newington News on Thursday, 17 January 2019 13:55. Updated: Thursday, 17 January 2019 13:57.